Drawing is essential to any kind of art. You need to know the basics of drawing so you can bring your ideas to life. The 13 lessons in this course will help the beginning student learn about things like perspective, shape and form, measuring, and creating interesting compositions. 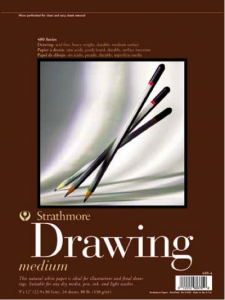 In the following lesson, we’ll discuss some of the basic materials you need for drawing. Click here to go directly to our recommendations on Amazon so you can have the supplies you need shipped directly to you! If you are already comfortable with your drawing skills, feel free to skip this course and go straight to the painting or sculpting courses. If you have taken drawing classes in the past but feel you could use a little brush-up, choose the lessons that will be helpful in getting your art brain back in motion! 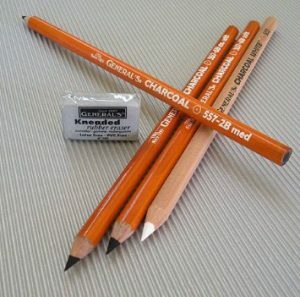 Drawings can be made with a number of materials, the most common being graphite (pencils), charcoal, ink and brush, silverpoint, pastels, and Conté crayon. We typically think of drawings rendered on paper, but they can be on any two-dimensional surface, including vellum, cardboard and wood panels. 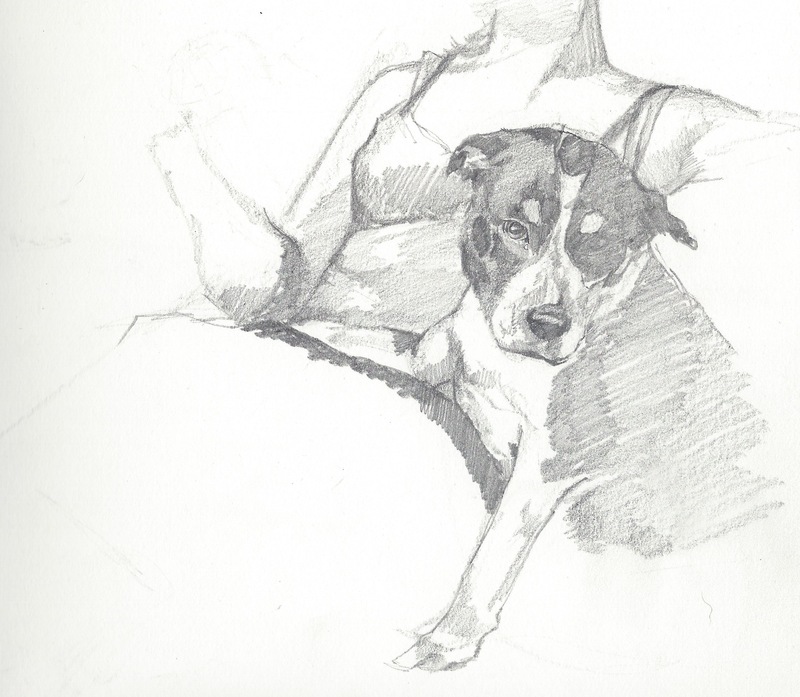 The person doing the drawing is called a draftsman or draftsperson—not a drawer! 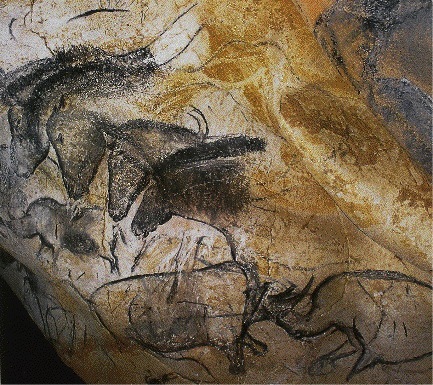 Some of the oldest works of art known to humankind are drawings. Of all the things our ancient ancestors did, drawing is one of the things we still share with them. We may not all run around hunting our own food or gathering wild berries, but drawing is a primitive mode of expression that is still incorporated into our daily lives. It is a means of communication that seems to be integral to our lives as human beings. Make your own simple cave drawing using your own pens or pencils (stick figures are fine). You are trying to leave a note for future cave dwellers without using any words, so draw pictures to get your message across. When you’re finished, send it to us using our submission form! Let’s see if we can crack your code. Our history lesson, Art History: The History Of Drawing, describes the history of drawing in more detail. If you’ve ever been to an art store and looked at the pencils, you’ve probably noticed how many there are! It looks overwhelming, but it’s quite simple. On the side of the pencil there will be a designation for the hardness of the lead. H means the pencil lead is hard and B means the pencil lead is soft. The number in front of each of those letters tells you how hard or soft it is—lower numbers being the least hard or soft to bigger numbers being the most hard or soft. Harder pencil leads leave lighter lines and softer the lead, the darker the line. So for example, a 6H lead is much harder (and will leave a lighter line) than a 2H pencil. A 4B is softer (and darker) than a 3B or a 2B. This is important to know so when you can achieve the look you want in your drawing. I typically start a drawing with an HB then go back in to block in shadows with a 2B, midtones with a 2H, then finish off the darkest darks with a 4 or 6B. One important thing to keep in mind with pencils is that if you’re drawing and the line isn’t dark enough, then you have the wrong pencil. 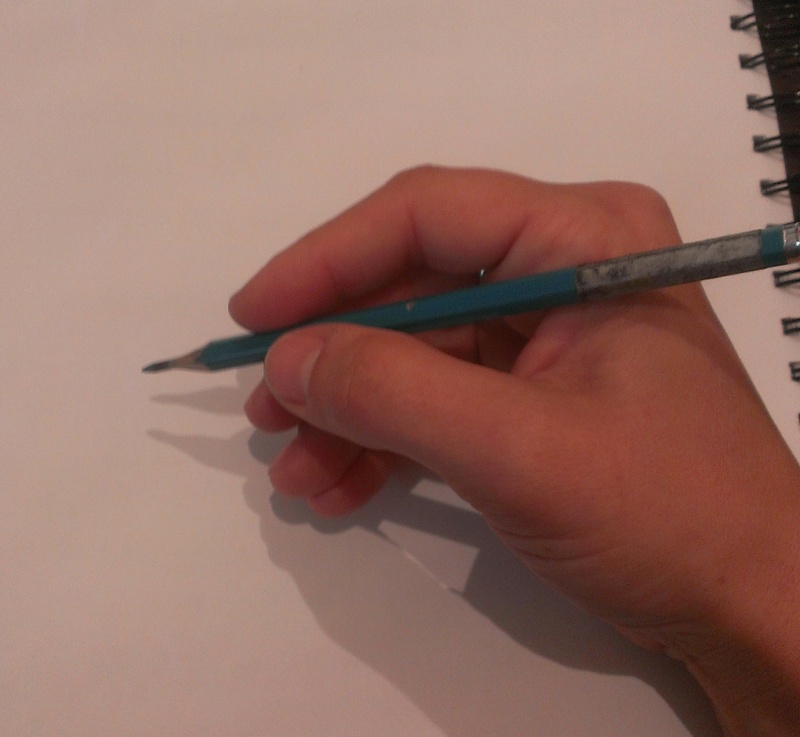 Don’t try to force the pencil to be darker by pressing it hard into the paper. This will only scar your paper and make the line impossible to remove later. Charcoal is a wonderful medium to work with. It tends to be darker than graphite (regular pencils) and like graphite, can also be purchased in a variety of hardnesses (light, medium, dark). 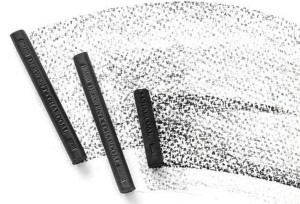 There are three main types of charcoal to draw with: compressed, powdered and vine. 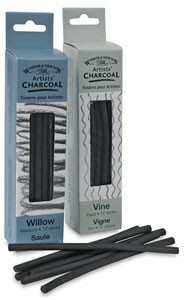 Vine (sometimes also called “Willow”) charcoal is very good for quick sketches and is easily removed with a towel or chamois. 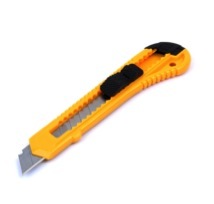 It does not need to be sharpened ever and produces a nice thick, dark line. Powdered charcoal is very good for shading large areas, but just like powdered graphite, it is extremely messy. 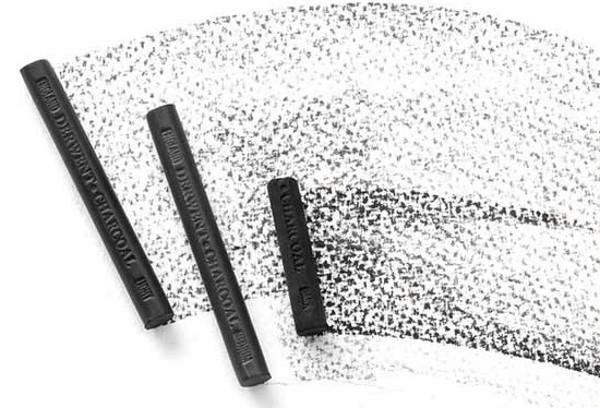 Compressed charcoal may come in sticks (as pictured above) or in pencil form. 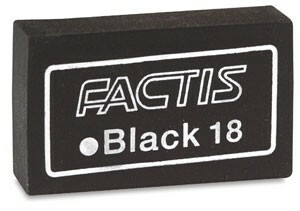 White spaces can be left blank or highlighted later with a white charcoal pencil. 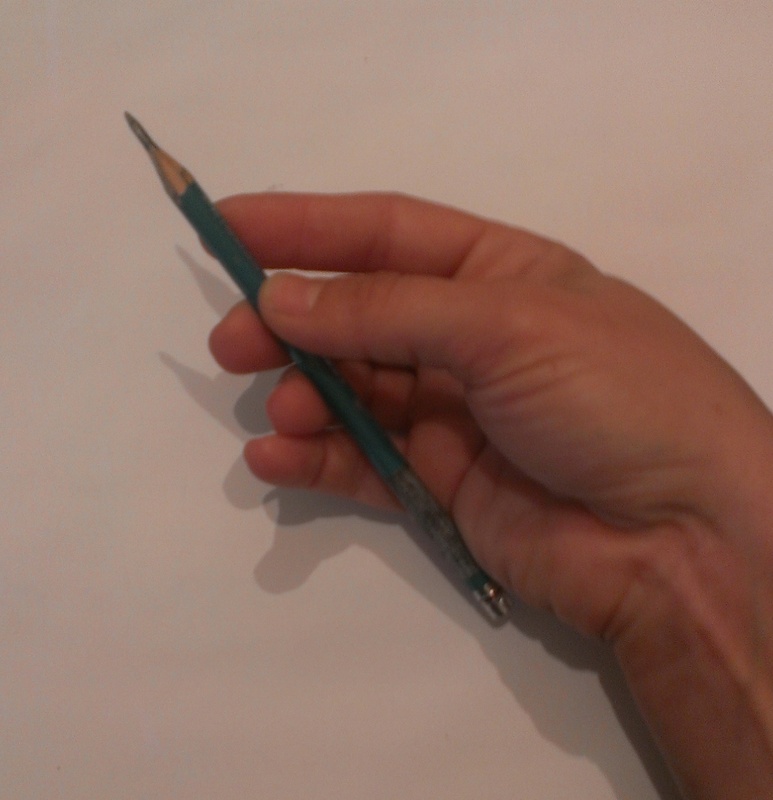 There are two basic approaches to holding a pencil when drawing. The first is to hold it as though you were writing, gripped by your thumb, index, and middle fingers. This grip gives you the most control and is effective for fine detail and cross-hatching (as shown in this link, cross-hatching is when you shade an area with multiple intersecting lines). Don’t hold the pencil too close to the graphite. The further back you hold the pencil, the freer and bolder your line quality will be. Experiment with holding the pencil in different places. 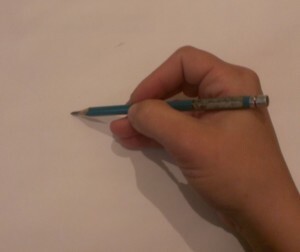 Holding the pencil near the tip. Holding the pencil in the center. Holding the pencil near the end. The second grip is more of an over-hand approach, holding the pencil as a conductor would hold a baton. This is a nice grip for using the side of the pencil (not the sharp point) and is useful for looser strokes and shading large areas. This is what it looks like from the underside. 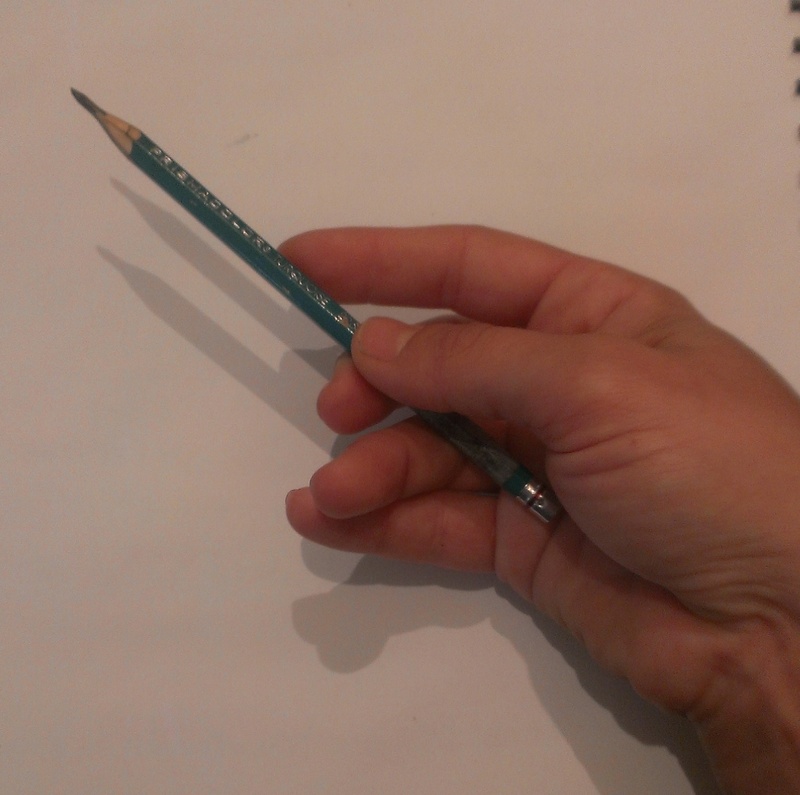 You can hold the pencil farther towards the end with this grip too. The shading on her head and body was done with the overhand grip and the finer lines around her eyes and mouth were done with the writing grip. Note the difference in the line quality. 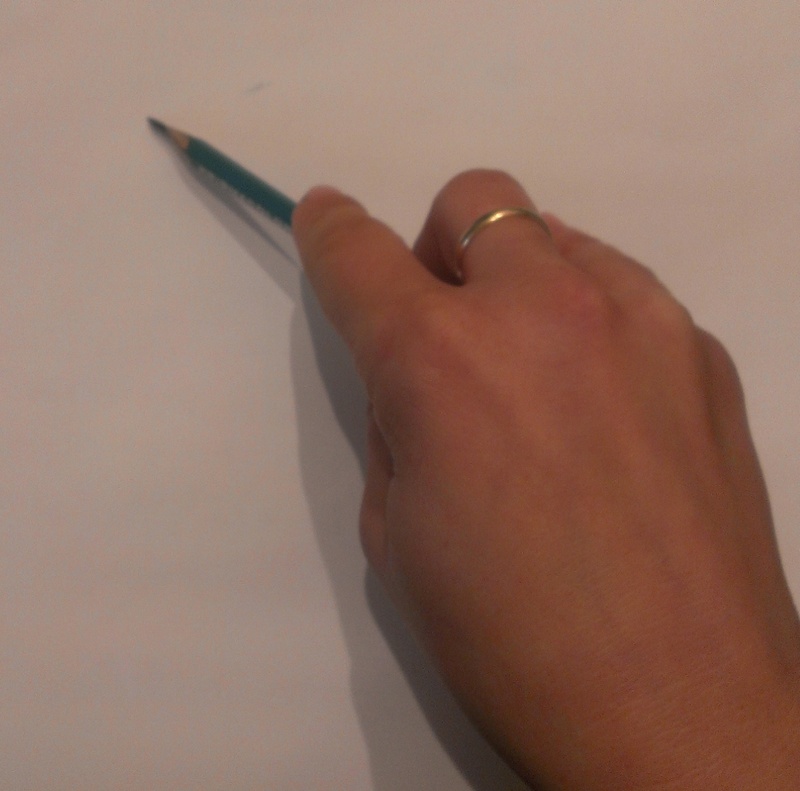 The overhand grip produces a soft, wider line and the writing grip produces a hard, fine line. The initial drawing and lighter areas were done with an HB pencil and then I moved on to a 4B for some of the darker, more defined areas. Sketch an object near you. Grab a piece of paper and a regular number two pencil with an eraser (in case you need it!). Sketch an object that is close to you (your computer? A sandwich?). Don’t spend more than 20 minutes—it doesn’t need to be the Mona Lisa! Hold your non-dominant hand in a way that’s comfortable to maintain for 20 minutes and sketch it with your other hand. When you’ve finished, send us your work! Use our submission form here. See how other students did in our Student Gallery! Some artists like to use electric pencil sharpeners or even manual sharpeners, while other artists may use a box knife and sandpaper. Both of these sharpeners can be purchased for about a dollar. If you decide to use a knife, BE CAREFUL! Always point the blade away from you, keep your fingers out of the way, and close the knife when it’s not in use. Keep out of reach of children. No monkey business—these things are seriously sharp! I personally love the knife and sandpaper, since it allows me to have more control over the length and shape of the pencil lead as well as the sharpness. To sharpen your pencil with a knife, hold the pencil with the lead facing the ground (away from you) with one hand and gently slice off the layers of wood surrounding the lead with the knife. It’s like peeling a carrot or a potato…it will take several passes with the knife to get down to the lead. Keep rotating your pencil so the lead is evenly exposed all the way around. Be careful not to nick into the lead (it may break). Once you’ve removed the wood from the lead to your desired length (1/4” – ½”), rub the pencil lead gently on the sandpaper (medium-fine grit) until you have achieved your desired level of sharpness. 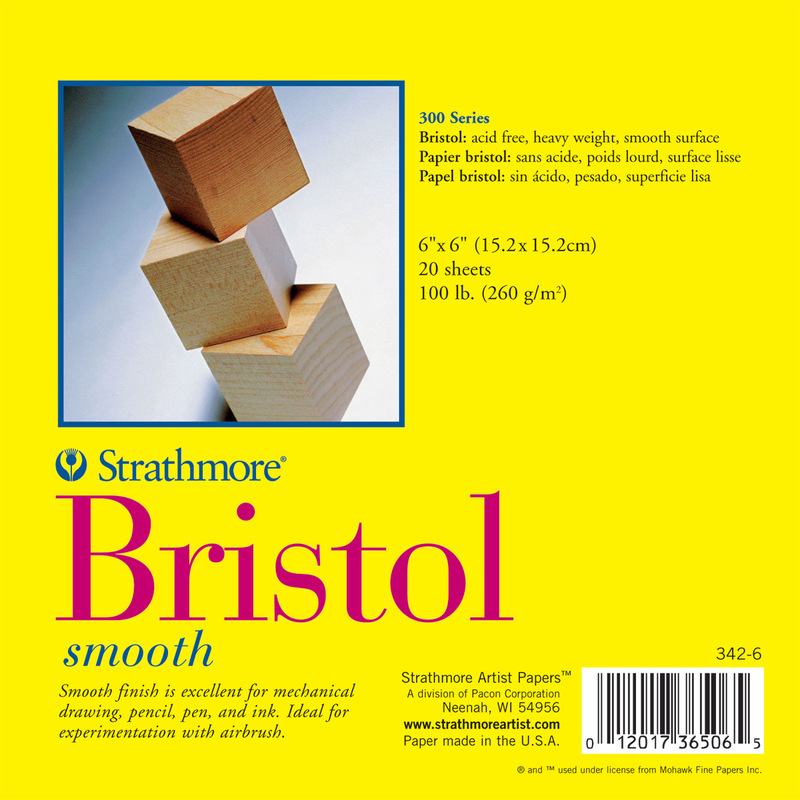 You can also purchase sanding blocks from the art store for this purpose, but I find sandpaper is less expensive and just as effective. There are many different kinds of paper you can use to draw on. One mistake that I see happen again and again with beginning art students is only drawing on cheap paper. There’s nothing wrong with working out ideas and practicing on inexpensive paper, but occasionally you’ll draw something that you really love and if it’s on cheap paper, there’s nothing you can do to change it. It’s a good idea to draw on better quality paper so when you do make something amazing, it’s the best it can be. 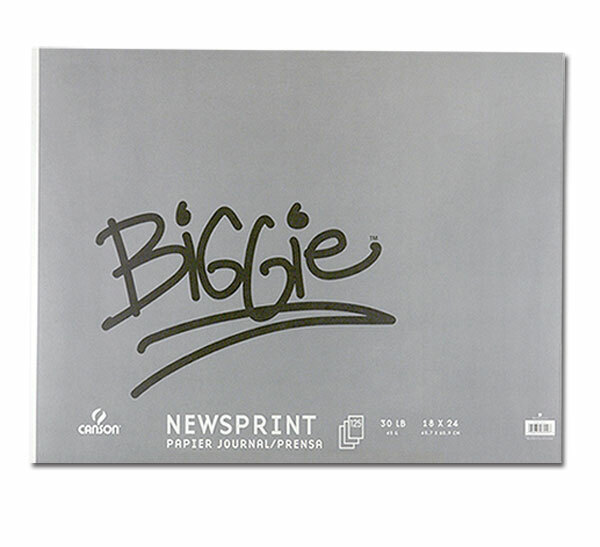 Papers come in many different weights, textures, colors, and sizes. Weight: The weight of the paper in your home printer is probably about 20 LB. High-quality watercolor and printmaking papers go up to 300 LB, which is very thick and almost board-like. Rough: This is a very textured paper that is the natural result when a sheet of paper is allowed to air dry without smoothing or pressing. Rough surface paper is a good choice for transparent watercolors used in a bold and immediate style, as it allows the pigment of color washes to settle into the hollows of the paper. Pastel artists also generally prefer a paper with “tooth” or texture to grab onto the pastel pigment. Hot Press: This is a very smooth paper. It is made by running a freshly formed sheet through heated metal rollers or plates. Much like a clothes iron, this smoothes out any texture left by the earlier stages and creates a flat, hard, featureless surface. A good choice for highly detailed illustrations, it is also used for printmaking, etching, drafting, sketching, and drawing. 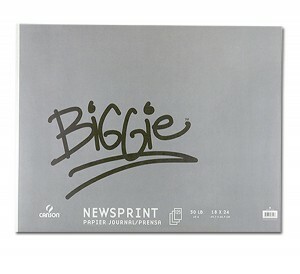 Cold Press: This paper is the most popular and versatile and has a slight texture. Handmade papers achieve this by re-pressing a new wet sheet, which smoothes the surface to some degree. Machine-made papers get a similar effect by placing the wet sheets between cold metal rollers. This is recycled paper that is inexpensive and often comes in large books (up to 24” x 36”). This paper is good for very quick sketches, exercises, and studies, but is not suitable for finished works of art. It is difficult to erase on newsprint because the paper fibers tend to come off with the eraser leaving holes or bare patches in the paper. 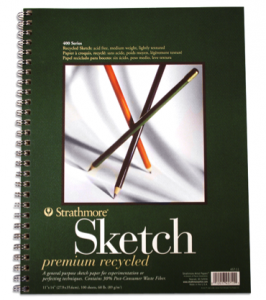 Sketchpads come in varying sizes and the paper is thinner than drawing paper but better quality than newsprint. The paper color is generally white. This is also good for sketches and quick ideas but isn’t ideal for a final drawing. Drawing paper is better quality than newsprint and sketch and is intended for final drawings. Because it is heavier weight than newsprint or sketch paper, it allows for better erasing without tearing holes in the paper. This paper can be purchased in a variety of weights. 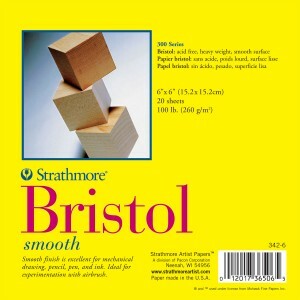 Bristol paper is a very thick, smooth paper that will withstand the moisture of inks and markers well. Just like when you were in school. Pink erasers are soft and pliable and leave no smudge marks behind. 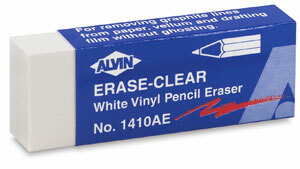 A good, multi-purpose eraser for erasing pencil. Black erasers are made especially for erasing charcoal and graphite. This is my personal favorite. Kneadable erasers can be shaped into any form and are good for removing or highlighting pencil, graphite, charcoal, pastel, and chalk. When it gets dirty, simply break it apart and “knead” it for a while. Fixative is a spray that you can use on your final drawing to protect it from smudging. This is particularly useful if you’re working with charcoal, which is very prone to accidental smudges. It can be purchased at most art supply stores. ONLY SPRAY FIXATIVE OUTDOORS. Do not spray it in your house or studio–the fumes are bad for your health (plus it really stinks). Now that you know all about your drawing tools, check out our printable Drawing Recommendation List. This will help you figure out what you need when you go to the art supply store. We’ve also put together a budget worksheet that you can download and fill out to help determine how much money you’ll need for basic drawing supplies. Make a trip to the art store with your Drawing Recommendation List and pick up your supplies! Be sure to check out our Drawing Budget Worksheet (Excel) or Drawing Budget Worksheet (PDF) first to make certain you have sufficient funds to buy your materials. Our budget is about $37. If you prefer to do your shopping online, check out our Drawing Course list on Amazon. You may not need all the supplies that are listed there, but we’ve added them all anyway so you can see our recommendations. buy it all or be selective–the choice is yours! Once you’ve gathered all your drawing supplies, try them out! Sharpen your pencils and try drawing some abstract lines with each of them. Which are darker? 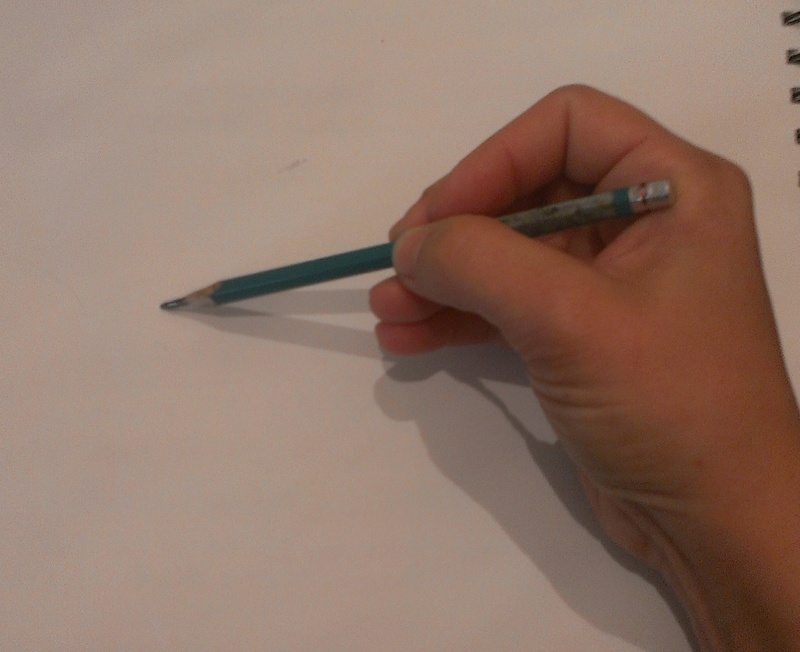 What different kinds of strokes can you get by using the tip of the pencil or laying the pencil on its side? Try using your erasers. 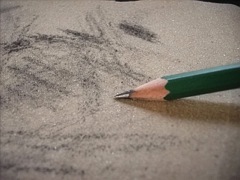 Make a point with your kneaded eraser and try dabbing it on your pencil lines. How are the two erasers different? Key Lesson Learnings: You have learned about the main tools needed to draw effectively, and understand the importance of using multiple pencils and different pencil holds to create an effective drawing.